Applications for the California Dream Act, which allows undocumented students to apply for state-based financial aid opportunities, are down by 20,000 applications from last year, according to the California Community Colleges Chancellor’s Office. This decrease comes at a time when students and young undocumented immigrants are facing uncertainty about their future in the country as a result of end of the Deferred Action for Childhood Arrivals program, also known as DACA. DACA provided young undocumented immigrants who entered the country as children work permits and protected them from deportation. After President Donald Trump ended the program in September 2017, DACA recipients have been waiting for a solution from Congress. However, aside from the decisions that could be made with regards to DACA, the California Student Aid Commission released a statement to remind students that DACA status is not necessary to apply for financial aid. California Community Colleges Chancellor Eloy Ortiz Oakley is urging eligible students to complete the California Dream Act application before the March 2 Cal Grant deadline. “I encourage all students, including DACA recipients, to apply today for the Cal Grant, as well as other forms of financial aid that are available year-round,” Oakley said in the release. In January, Lupita Cortez Alcala, executive director of the California Student Aid Commission, released a statement reassuring students and families in the State that student information is protected at the greatest extent of the law. The commission, a state agency that gives free financial aid to California students, also oversees applications for the Dream Act that provides financial aid for undocumented students who are attending or want to attend California colleges or universities. “We at CSAC understand the fear that the current political climate surrounding immigration has caused many undocumented students and their families, particularly when it comes to applying for state-sponsored student financial aid through the CADAA,” Cortez Alcala said in the statement. “The California Student Aid Commission has not now, or in the past, shared any information which would indicate a student’s immigration status, either documented or undocumented,” the statement on the website reads. 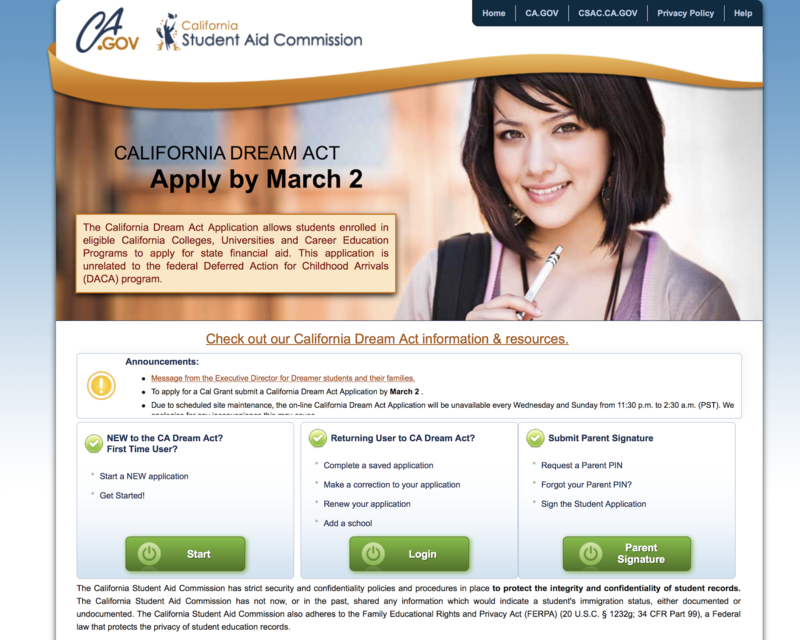 Students must submit their California Dream Act applications by March 2 to receive financial aid from the State.